Demonstrators in Madrid, Spain protest austerity and temporary work, April 27. Not Empty “Real Democracy,” But Fight for Workers Power! For the last two months, across southern Europe hundreds of thousands of people have taken to the streets to denounce economic policies which have produced misery on a scale not seen since the last Great Depression in the 1930s. Rather than limiting themselves to the usual mass marches, from Portugal and Spain in the west to Greece in the east, tens of thousands, mainly youth, have occupied city centers for weeks in an upheaval that has taken the name of los indignados, “the outraged.” What particularly sparked their rage is that in all three countries, the ruinous policies have been imposed by governments calling themselves “socialist,” who were elected because they claimed to defend the population against the plutocrats. The initiators of the protests have seized on this sense of betrayal to pose the issue as one of “democracy,” saying that the rules must be wrong in a system where no matter what the people vote for, governments obey the dictates of the banks. But although many say today they are not “against the system,” in the course of the struggle some will discover that the root of the problem is capitalism. The task of revolutionary Marxists is to bring that lesson home and build the leadership to lead the necessary socialist revolution to sweep away that system that today is destroying the lives of millions. The appearance of multitudes of young people, responding to appeals in Internet social media (Facebook, Twitter, etc. ), sitting in and camping out in the central squares of southern Europe produced a torrent of bourgeois media attention and set a host of leftist groups wildly cheering. “Like the Arab Spring, the Spanish movement is rooted in economic distress, spread via social media networks and led in the streets by the young,” reported the International Herald Tribune (26 May). Same theme from the left: “Pictures of Madrid's central plaza known as Puerta del Sol bear an uncanny resemblance to Tahrir Square in Cairo,” wrote the Socialist Worker [U.S.] (“Signs of a Spanish spring,” 26 May). A Spanish group, Clase contra Clase, added a comparison to the 1848 Revolutions that swept Europe, “The Springtime of the Peoples Crosses the Mediterranean” (CcC declaration, 20 May). A week later it made a parallel to the 1968 French upheaval, “May ’68/May 2011” (Contracorriente, June 2011). Argentine leftist academic Atilio Borón went even further, comparing “The ‘Indignados’ and the Paris Commune,” and declaring “Nothing will be the same as before” (kaosenlared, 22 May). The “movement of the squares,” as it has become known in Greece, is a new development, and it represents a new layer of the population entering into struggle against the consequences of the global (capitalist) economic crisis that is ripping up their lives. But this kind of breathless enthusing is counterposed to a Marxist analysis. It completely ignores the vital issue of class: the class composition of the protests and the class content of their politics. The recent sit-ins and camp-outs were led by relatively privileged middle-class youth, with limited presence of young workers and still less of immigrant workers. Describing the “geração à rasca” in Portugal, an article in the French daily Libération (4 June) noted that “this peaceful insurrection is first of all that of a younger generation which lacks stable employment even though it has a surfeit of diplomas.” The writer quotes a leading organizer of the March 12 demonstration saying: “We are all collectors of masters, of doctorates and of post-docs. 300,000 of us are unemployed, as for the rest, we are reduced to green slips” (with no job protection, subject to firing/layoff at any moment). Many university graduates have to make do on incomes of €500 ($700) a month. The class position of the demonstration organizers is expressed in their demands. Thus the Manifesto of the “Precarious Generation” in Portugal states: “We are not given the chance to show our potential, thus blocking the betterment of social-economical conditions of the country…. We are the highest-qualified generation in the history of our country…. We do believe we have all the resources and tools to provide a bright future to our country and ourselves.” In Madrid a sign proclaimed, “We Are the Best Prepared and Least Valued Generation.” This is not a cry of rage by the downtrodden and oppressed but the lament of a potentially well-off petty-bourgeois layer resentful that their qualifications are not being used and of being forced into the ranks of the proletariat. There is nothing at all in their demands against the capitalist system. A list of Democracia RealYa’s proposals in Spain calls for “reduction of tuition in all university education, reducing the price for graduate students to that of undergrads.” How about calling for no tuition and open admissions to higher education? 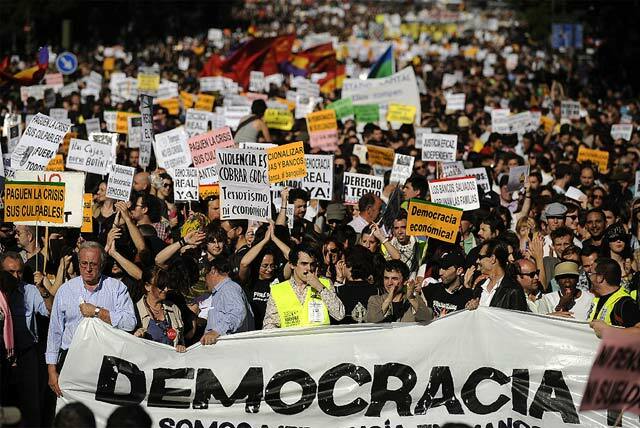 Demonstration calling for “Real Democracy Now” marched to Madrid’s Puerta del Sol, May 15. An account of the origins of DRY (kaosenlared web site, 6 June) relates that it grew out of a Facebook page of a “Platform of Groups for a Citizen’s Mobilization,” formed by the initiators and administrators of various blogs which had arisen to voice “discontent with the crisis.” (Nobody on the political left had heard of them, so that this initiative seemed to come out of nowhere.) The nucleus at one point reportedly included several “far left” activists who later dropped out when their proposals were turned down. 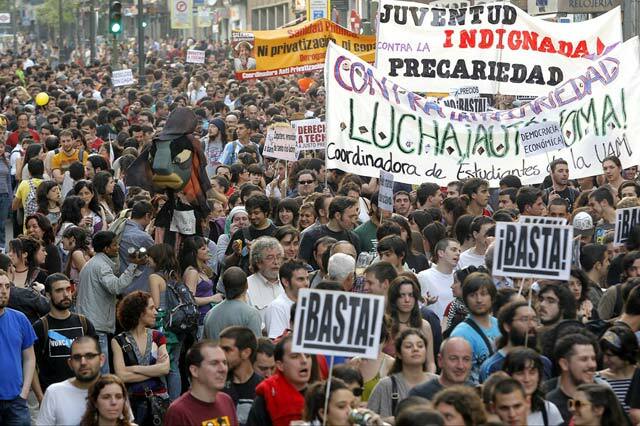 A component was Juventud SIN Futuro (Youth Without Future: Without Houses, Jobs, Pensions, Fear), which had held an earlier Madrid demonstration on April 7. Its Manifesto was signed by a number of leading academics and a member of the editorial board of the left-wing bourgeois daily Público. But DRY also includes liberal (i.e., right-wing) elements such as the group “nolesvotes” (Don’t vote for them) pushing liberal electoral reform. While the original organizers of the protests come from this privileged layer – also the case in Egypt and Tunisia – as the occupations of the plazas mushroomed, they attracted more heterogeneous crowds. Among them, leftists showed up, and to some extent trade-unionists who had been active over the last year marching against the austerity program. However, the demo organizers were determined not to allow the protests become or be seen as having a left-wing character, much less socialist or communist, for fear of alienating mainstream middle-class sectors. So DRY issued a call for the May 15 demonstration that emphasized it was sponsored by “non-political and non-union organizations,” and insisted there would be “no banners of a political or trade-union character.” Above all, no hammers and sickles, or UGT or CCOO (or CGT or CNT or any other) union banners. The fact that swastikas were also theoretically banned doesn’t change the character of this anti-communist, anti-labor prohibition. This was no abstract matter. At a May 26 march in Sevilla organizers used a bullhorn to tell people not to take leaflets of (left-wing) parties, and a microphone was seized from a member of a trade-union plant committee. 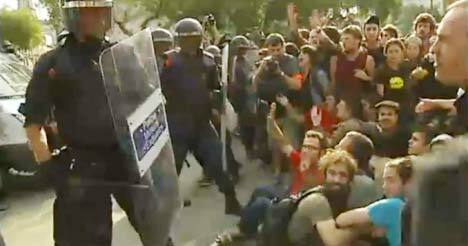 At a June 15 blockade of an eviction in Barcelona, indignados roughed up Izquierda Unida (United Left) leader Cayo Lara. This treatment, even of a reformist sellout, is counter to workers democracy. The indignados and aganaktismenoi don’t just include “non-party” youth and petty bourgeois. They include a striking number of lawyers, business consultants and IT specialists whose views are hardly radical. In fact, some of those connected with the DRY founders are considerably further to the right. This is the case of the Democracia Participativa outfit, which is sponsoring an October 15 referendum on electoral reform and is closely tied to the Madrid-based Cuban gusano, CIA agent and European Liberal leader Carlos Alberto Montaner; to the virulent anti-communist Peruvian writer and Liberal luminary Mario Vargas Llosa, also based in Madrid; and to the right-wing free-marketeers of the Cato Institute in Washington, D.C. In fact, some of the anti-party and anti-union rhetoric coming from the DRY and 15-M milieu is not at all from left-wing anarchist sorts but from right-wingers similar to the Libertarian Party in the United States. While there are some highly dubious types among the initiators and prominent spokesmen of the indignados – and the “movement” itself is hardly leftist or “anti-system,” despite some right-wing media claims and wishful thinking by opportunist leftists – many participants were politically inexperienced middle-class youth, tired of being labeled passive, outraged by their desperate economic situation and seeking somehow to change it. What they experienced during the several weeks that the acampadas lasted was something of an extended political “happening.” Many had their first run-in with the police, even though PSOE leaders were wary of setting off a major confrontation. The supposed “participatory democracy” of the endless assemblies and the anti-democratic procedures of insisting on consensus (which some eventually abandoned) hardly prepared them for the kind of hard struggles ahead. The experience of self-organization and the spread of assemblies to working-class barrios broke out of the bureaucratic mold of traditional labor/left mobilization. But in addition to being prey to reactionary forces, a “movement” for classless “real democracy” cannot provide an answer to the ravages of the capitalist economic crisis. That requires a mobilization of the working people and their allies on a class program, and a fight to build a genuinely communist leadership. That will not be accomplished by chanting “the people united will never be defeated” – the slogan of the Chilean Unidad Popular of Salvador Allende, which suffered a very definite, bloody defeat. As did the Spanish Republic, whose “popular front” bourgeois-democratic politics were a roadblock to the proletarian revolution which was then and is today the only road to defeating Francoist reaction. Defeat Capitalist War on the Workers – Fight for International Socialist Revolution! The depth of the capitalist economic crisis is such that not only the working class and poor are heavy attack, but also much of the petty bourgeoisie. Even before the developing crisis broke in the fall of 2008, the fabled “middle class” in the United States, Western Europe and other imperialist countries was being hollowed out. Over the previous quarter century, the incomes of all but the highest earning layers were stagnant or fell, even as profits, stock markets and capitalists’ incomes soared. Between the smashing of unions, the displacement of manufacturing activity to low-wage countries and systematic attacks on social services, the so-called “safety net” of the “welfare state” had become threadbare, and is now disappearing altogether. Driven to the wall, the intermediate layers between the bourgeoisie and the proletariat have belatedly begun to react. Unfortunately, and mainly because of the lack of a fighting workers movement, in the United States this protest has gone mainly to the right, in the form of the racist Tea Party movement. Where labor has fought, as in Wisconsin until it was called off by union bureaucrats supporting the Democrats, it has eclipsed such demagogues. In Europe, the situation is distinct due to the existence of a union movement ostensibly linked to socialist or labor parties. Under pressure from the ranks, the labor tops have sometimes gone through the motions of fighting back against the capitalist onslaught, as in the dozen or more one-day “general strikes” in Greece last year (and now a two-day walkout) and the weekly mass mobilizations against pension “reform” in France in October-November 2010. The British unions have dragged their feet on even holding peaceful parades against the attacks by the Conservative-Liberal coalition. But even where accompanied by rock-throwing and brutal police attacks as in Athens, these marches have had a ritual quality and haven’t made a dent in the governments’ determination to carry out the austerity measures dictated by the banks. Moreover, in Portugal, Spain and Greece – the current focus of protest – the attacks on workers gains have been carried out by “left” governments of parties claiming to be socialist. Thus the appearance of largely petty-bourgeois movements of indignados and aganaktismenoi, and their hostility to “parties” and “unions” in general is a direct result of the betrayals by the misleaders of the working class. However, while their anger is directed against bankers and capitalist governments, the protesters’ consciousness is by no means revolutionary, or even necessarily leftist, as we have seen. The “movement” is politically amorphous and tentative, but not “anti-capitalist” as some would have it. A banner in Madrid’s Puerta del Sol declares, “We Are Not Against the System, The System Is Against Us” (No somos antisistema, el sistema es antinosotros). In fact, the demands have clearly been formulated to avoid calling into question capitalism/imperialism. In Spain, the DRY calls for nationalizing only those banks which have been bailed out and prohibiting investment in tax havens. It calls for idle housing to be rented at moderate rates, and for handing over the property to cancel debt in the case of foreclosures, rather than to stop foreclosures. While calling for shortening the workweek, it does not specify no loss in pay. While calling for a “reduction” of military expenses, it has not a word against NATO, or Spain’s participation in the NATO war on Libya. But there is no vehicle to achieve even these minimal bourgeois measures. How, then, should revolutionary communists intervene in such a context? It is necessary to patiently explain that the capitalist system as a whole is in crisis, that it’s not just a matter of greedy bankers and corrupt politicians (although there are plenty of those), that while putting forward transitional demands that challenge capitalism, ultimately and immediately the only way to defend gains won through hard struggle over the last century is by fighting for, and carrying out, international socialist revolution. To lead that struggle, it is above all necessary to forge the nucleus of a revolutionary workers party like the Bolsheviks of Lenin and Trotsky. The vast bulk of the European left is doing nothing of the sort. They don’t challenge the “democratic” (bourgeois) program of the “movement of the squares,” because this left is itself thoroughly reformist – even those components once called the far or extreme left – and doesn’t fight for, or even believe in, socialist revolution. Their calls for nationalizing banks, restoring “public ownership” of utilities, etc., are merely an appeal to restore the bourgeois “welfare state” of yore. But the capitalists will do nothing of the sort unless they fear for the survival of their system – and even then, such measures cannot end the economic crisis or eliminate mass unemployment. So what has been the response of the European left to the rise of this new “movement” of outrage over the new wave of attacks on workers’ livelihoods? The particular responses of the different left groups vary. Faced with bans on party symbols or identification, they have almost all been “discreet” – i.e., hidden their affiliations. Miguel Romero of Izquierda Anticapitalista (IA, Spanish section of the “United Secretariat of the Fourth International”) put it this way: “it is necessary to be very prudent and reserved, notably in relation to self-affirmation” (International Viewpoint, May 2011). José Luis Centella, general secretary of the Communist Party of Spain (PCE), vowed “we respect the rhythms and forms of the mobilization that has arisen since May 15,” and he even “understand[s] when they [the indignados] say we don’t represent them” as they manhandle the leader of Izquierda Unida, the left electoral front of which the PCE and IA are a part. How very prudent and respectful and understanding of anti-communist exclusion! Other Stalinist outfits emphasize that they agree with the (bourgeois) democratic program of the indignados and say “let the citizenry go through its own experience” (PCE-ml). Several social-democratic groups which when it suits them pretend to be Trotskyist – En Lucha (affiliated with the British Socialist Workers Party), Militante (leading component of the Corriente Marxista Revolucionaria), Socialismo Revolucionario (affiliated with the Committee for a Workers International) – see the “movement” through rose-colored glasses and accept its “democratic” framework. En Lucha (5 June) writes, “How We Will Achieve a Real Democracy.” Militante (21 May) claims that “most of the demands” approved by assemblies “clash with the underpinnings that support the capitalist system.” Nonsense. Here and there, leftists have managed to get this or that plank passed, but even bourgeois journalists can see that “despite the creative explosion in the slogans, the demands are moderate” (Público, 29 May). A spokesman for Socialismo Revolucionario admits that “Some participants in the movement reject political organisations, trade unions and even the revolutionary left, in general,” but only pleads for “allowance in the movement for tendencies and groups that support basic and democratically agreed demands” (CWI, 6 July). So what about those who call instead for workers revolution? Even the democratic demands raised by various left groups are extremely limited. There is little mention of the reactionary king Juan Carlos, protector of the army, Guardia Civil and the rest of the repressive apparatus of the capitalist state. The camp at the Plaza del Sol has called for down with the monarchy, but to replace it with what? While seeking to mobilize the working class, poor and hard-hit petty bourgeois to fight the capitalist assault, a revolutionary nucleus would fight to bring down the monarchy, inherited from the Franco regime, in the struggle for a workers republic. It would defend the right of self-determination and for independence for Euskadi, the Basque country divided and oppressed by Spain and France, for returning the enclaves of Ceuta and Melilla to Morocco. It would call to mobilize the unions against police attacks on the anti-austerity protests, such as the brutal assault by the Mossos d’Esquadra against demonstrators on May 27, and for the formation of self-defense squads. This would, of course, clash with organizers’ policy of “non-violence” (toward the state). Where are the demands in defense of immigrants? Trotskyists call for the basic democratic demand for full citizenship rights for all immigrants, with or without papers, as was granted by the Paris Commune of 1871 and the Bolshevik Revolution of 1917. Curiously, one of the most glowing in its portrayal of the “movement” of indignados is the centrist Fracción Trotskista (FT), led by the Argentine Partido de Trabajadores Socialistas, and its Spanish affiliate Clase contra Clase (CoC). In 20 articles (plus an equal number of videos) in a special section on “The Spanish May” on the FT web site, there are few critical comments about the politics of the leaderships of the “movement” (or non-leaderships, since they pretend not to have any). There’s barely a mention of the existence of groups like Democracia Real Ya, as if this movement just arose by itself, a virgin birth. All the CoC (20 May) has to say about the purely “democratic” platforms approved by the assemblies is that “they are a very good point from which to advance.” After ten days or so the FT/CoC complained that “some anarchist and autonomist currents” are pushing to “reject any organization of workers or political group” (26 May). But like the reformists, it accepts the overall framework of a fight for “real democracy.” The CoC does call for bringing down the monarchy, but as part of a “constituent process of the entire Spanish state, a Constituent Assembly” based on a “single electoral conscription” rather than a fight for workers power. Its main call is for connecting with the workers movement, and it has publicized meetings of “outraged workers” in the Barcelona region. Tomasz Szabelewski, a spokesman for the May 15 Movement, featured in TV reports of the camp in Puerta del Sol: his day job is as a business consultant for the Éveris Foundation, a “neo-liberal” think tank whose leaders have been ministers in both PSOE and PP cabinets and are linked to the BBVA bank, the privatized Telefónica and other leading companies. The Foundation issued an Informe Transforma España (Transform Spain Report), delivered to King Juan Carlos last November, calling for political reform to streamline the Spanish state and make it more responsive to the demands of the financial system. Enrique Dans, creator of “nolesvotes” and an early and prominent supporter of DRY: he has an MBA from UCLA, post-doc at Harvard Business School and is a professor of information systems at Madrid’s Instituto de Empresa. Olmo Gálvez, a spokesman for DRY: he is a former trade officer at the Spanish embassy in Beijing and a consultant of the French business technology company CapGemini. Fabio Gándara Pumar, profiled in the right-wing Madrid daily El Mundo (22 May) as the founder of the DRY: he is a lawyer with a masters in urban planning. The paper reports, “The father of the Spanish Revolution is not against the system” but says he “believe[s] in the parliamentary system” and was “worried that the anti-system people would ruin the party” on May 15.